Wondering about the lilacs that were coming and whatever happened to the blooming lilac photo I said I would post? Sadly, as often happens here, those promising little buds were killed by a late frost. But there's always hope for next year. And of course now we have irises. Lamb Report: Alison and her big baby girl had their first day out yesterday, and it went very well. I guess Alison learned her lesson last year when she kept tucking baby Beattie (who was a late born surprise) into safe spots and then heading off with the rest of the wandering flock. The two of us did a lot of frantic jogging together last year. Yesterday she stayed glued to her lamb and close to home--unlike the sheep who went on a wild mountain trek in the woods. Current Lamb Count: 22. Little Caraway had a big day yesterday, too. I'm hoping to post a photo and a Cary Report later. 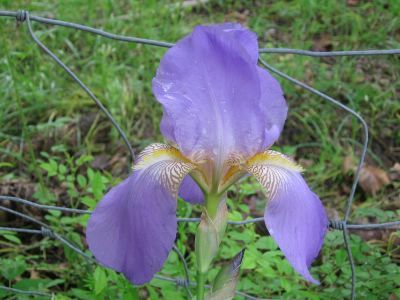 What a lovely Iris. I'm looking forward to mine opening in several weeks. Those adventuresome sheep on their wild trek should be careful of what lurks in the woods--I hope they had their bells on. As for the little darling of your farm, Caraway, I know I'm not the only one who wants to find out how she's doing and see more pictures. Thank you for being my daily "reality show". I tried your pita recipe, and I was so impressed with how well it worked. I made it partially with whole wheat flour, whipped up some fresh hummus, and my family devoured them all within minutes of them coming out of the oven. (Even the unavoidable flat ones). Thank you so much! My irises haven't started flowering yet, but this reminds me that they need some support soon, last year they got so tall they flopped over. Glad to hear mother and daughter are doing well. By the way, I loved your Mother's Day story! irises are just about the most beautiful flowers i have seen second to lilacs only, i think. :) and nothing can beat that scent, either ! Oh, those crazy sheep and their little mountain trek. I couldn't believe it when I found them on the very, very steep hillside next to the creek (which just stopped running yesterday, sniff). They don't have their bells on yet, but they definitely made a lot of racket. I had no idea what was going on, just heard all this loud crying. I rush over and can see three or four sheep (including a couple lambs) looking like they are stuck in a sort of hole in the side of the hill. Of course by the time Cary (who I had to hold in my arms because the walking was too treacherous) and I made it up to where they were, they were happily munching away about a hundred yards down the creek. Welcome to the farm! Yes, you are right about the scent of lilacs being divine. I don't think I'd ever actually seen or smelled a lilac bush until I moved to Missouri--I am in love. I had no idea what I was missing. There is nothing like a lilac. Great to hear about your success with my pita recipe. Thanks so much for taking the time to write and let me know. Hmmm, a little whole wheat flour tossed in sounds very interesting. I'll definitely have to try that. I once lived in a house that came with a beautiful bed of bearded irises. They had such big flowers and so many blooms on each stem, though, that they would all fall over. I don't know if that's from iris breeders going crazy or what. I know that's happened with other types of flowers--they create these varieties that have such huge blooms that the plant just tips over. Peonies (which I absolutely love and which grow well around here for everybody except me) are a good example. You can even buy special 'peony rings' to stand up your plants. Always nice to hear from you. Oh, first of all, let me go way back to a question you asked several days ago that I never got around to answering. You wanted to know which Classic Rock songs I was softly singing when I got back in bed after a 3am trip to the barn. Okay, I know the first one was that "We don't need no education" song. I thought it was appropriate since none of my sheep are planning to attend school. The second one has completely slipped my mind. The third one (which is the one that got me shut down) was the one about "TNT bla bla bla" "TNT Watch me explode!" Never a dull moment around here--even at 3am. I'm definitely going to email Alice Cooper one of these days and let him know about his barnyard listeners--and the fact that I'm using his show as Coyote Away. Every time I'm in the barn he's telling people to email him. The announcer even says things like "Alice is going to check his email during this commercial break!" Anyway. . . yes, Alison and her big baby girl are doing just fine and loving the fresh grass and sunshine. So glad you liked my Mother's Day story. Speaking of the scent of lilacs, does anybody know of a perfume that smells just like lilacs? Or maybe a source for lilac essential oil? Thanks for resolving the 3 AM music mystery! I think you definitely should e-mail Alice Cooper to let him know he has many new fans down on the farm... and they happen to be a bunch of barnyard animals!! He would probably reminisce about one of his concerts and write a new song that would become a big hit!! Many crazy lyrics come to mind. I'm not familiar w/ lilac but I have this locust tree in my backyard and when it's in bloom people stop in their tracks to inhale the beautiful fragrance! !